Firstly, to answer the question Mackay’s businesses have been asking around the Tourist Information Centre based at the City Gates; yes the Tourist Information is still open for business and will continue to welcome and inform our visitors and tourist to Mackay. The new Mackay Region Visitor Information Centre and the long-awaited Sarina Field of Dreams Parkland Masterplan was a key initiative for the region and recognised the importance of tourism as an economic driver. With construction underway on the Mackay Ring Road, the need to capture the north-travelling drive market before they bypass Mackay became apparent. The dilapidated Queensland Rail Building at the Field of Dreams Parklands Sarina, presented the perfect opportunity to house a modern state-of-the-art visitor information centre. The project has enabled the successful transition of the new Visitor Information Centre into the existing Sarina Field of Dreams Parkland, with the positive ripple effect of the investment into the local economy starting to show signs in the community. With the project completion the benefits of the investment to the tourism industry are only just being realised. However, what is clear is the investment in local businesses through the construction phase of the project. Throughout the construction phase of the project, the $3.45m invested in the project enabled the engagement of over 30 local businesses, varying from various skilled fields, including, but not limited to, construction, information services, technical engineering support, design, and local commercial traders. Furthermore, internally within Mackay Regional Council, 25 programs have provided support to ensure the success of the project. On top of the employment opportunities created through the project, it is known that the broader social and economic benefits through the establishment of a new Visitor Information Centre and associated infrastructure has the capacity to enable rapid change for the region’s perception, for both existing residents, past visitors and new visitors. A Visitor Information Centre creates a social environment and is a highly visible element of the region to passers-by, visitors and locals. 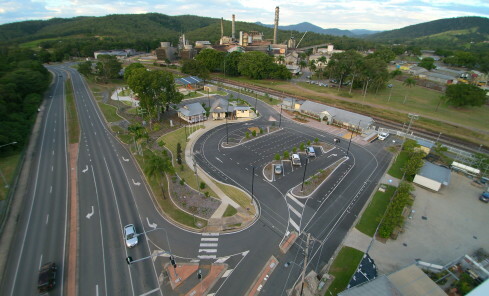 The project not only aimed to address a much larger economic concern for tourism and small business, but it also along the way created the opportunity to enhance parking issues for a community, general infrastructure at the Parkland and in addition, created a socially welcoming environment for visitors and residents of the Mackay Region. With the new Visitor Information Centre only recently opening its doors to the public on 1 July 2018, the statistics are new, but are already speaking for themselves. In comparison to the same period in July 2017, the new Mackay Region Visitor Information Centre has seen an increase of 18.5% in visitation. Even more recent, the local media has issued stories on the positive impact the investment is having on the Region, in particular, reporting on increased spending with local commercial traders, increased bookings of tourist experiences, extended stays in the Region, record high visitation at the Sarina Museum and, a generally positive outlook in the community. The project has also drawn the attention of Creek to Coast, with a story on the new Visitor Information Centre and Sarina Field of Dreams Parkland aired nationally. If you have any information or publications that you feel visitors to Mackay would be interested in reading, contact Mackay Tourism on 48371277 better still why not pop along to one of the Centres and introduce yourself.